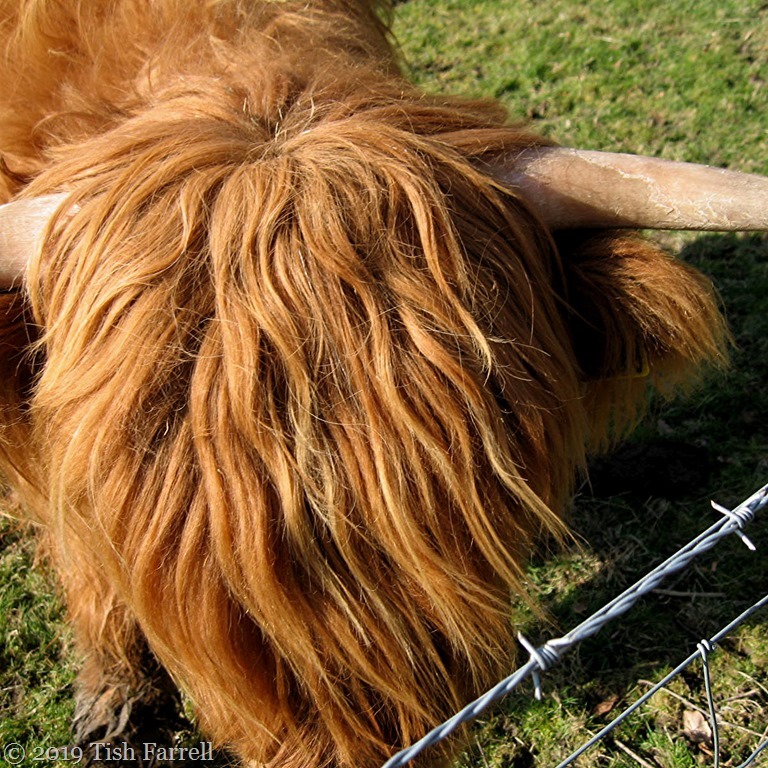 Posted on March 25, 2019 by Tish Farrell	This entry was posted in Farming, Much Wenlock and tagged #SpikySquares, Highland Cattle, Much Wenlock, The Cutlins, Tish Farrell Writer. Bookmark the permalink. They do get in a pickle with the hay. I’m not sure having a fringe that long is good for the eyesight. But they are very appealing creatures, unlike the massive, muscle-bound bulls in ‘our’ field. It’s called a dossan and apparently protects their eyes! Really? The things you learn on here! Well, I didn’t know that, Becky. But it makes sense when their original homeland is in such very bleak and blustery parts. I had to investigate after seeing yours peer through their hair! they are kinda cute,but I do wonder just how much they can see. Kinda like a sheep dog that is shaggy. The MacMoos are designed for the extreme winds, snow and rains of Scotland, so guess they need to be well protected. Maybe insulation against the heat too. Oh yes, and there are awful clouds of small biting insects in Scotland in summer. Co-‘moo’-ning with nature, Tish 🙂 🙂 Sorry! I love them . . . 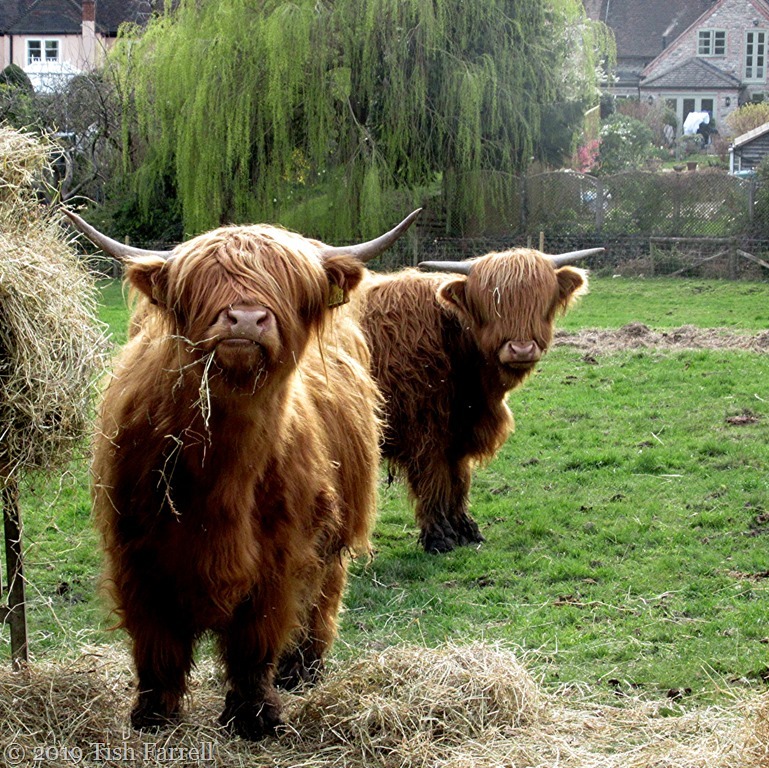 I want them in a field near me. Clearly I am going to have to move!! Human neighbours can be so disagreeable. Yep. We have (I swear) the inspiration for Harry Enfield’s Wayne and Waynetta on one side, and a German nudist on the other. I’ve learned not to idly look out of my upstairs windows on days when he might be using the spa pool, but my mum got a bit of a shock when she was visiting. All that hair! It’s a wonder they can see.